The ever popular movie 'The Fast and the Furious' is about to come to its 6th installment. As a matter of fact, you'll be witnessing 'Fast and Furious 6' on the silver screen worldwide starting May 24th. As always, we've got used to sports, exotic, and tuned cars in the series. However, we've never got to see a BMW M5 in them in spite of what the car has to offer. With that being said, it's about time the model makes its debut. So, in this 6th installment, besides other very interesting cars, there'll be around a dozen of BMW M5s. Nonetheless, don't expect to see the current model as all those 12 cars will be the V10-revving E60 model. Personally, I think the model looks attractive even when it is in a complete standstill mode, not to mention when it is involved in a highly intense full throttle action thriller. The design cues are attractive, both on the front and rear fascias, so attractive that some people in Indonesia even nicknamed it 'the eagle eye'. Unfortunately, according to 'Fast and Furious 6' Car Coordinator, Dennis McCarthy, the person in charge of setting up the cars for you to see on the big screen, most of the 'eagle eyes' had to be destroyed while filming. What a pity� But then again, you won't be able to make a great action movie without such a sacrifice. It's just the name of the game. According to Dennis, all they had to do with the M5s for the driving scenes was to unplug its ABS - thus deactivating the car's traction control - and to weld the spider gears together. He mentioned, though, that one of the M5s actually survived. How lucky! 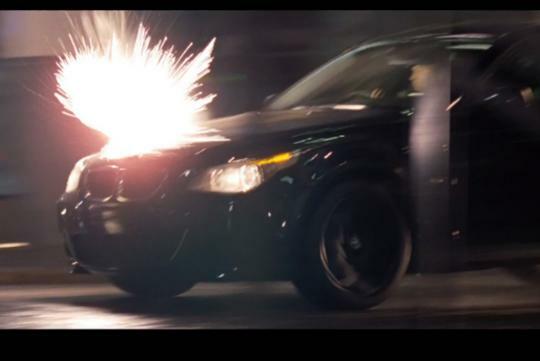 Judging from the massive number of BMW M5s involved in the latest installment of the 'Fast and Furious', you might think that it's a marketing campaign from BMW. However, let me tell you, it isn't. It's simply because the movie was partially shot in Europe that it seemed appropriate for a European model to appear on the screen. Why BMW, you ask? Well, for that, maybe we'll know it once we get to see the movie. For your convenience, here's the first extended trailer of the movie and the latest one, respectively.